Hey all! Here is where you can find all of the quick cleaning tips I’ve gathered from life and the wonderful internet. 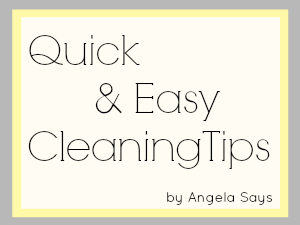 Please feel free to comment here on your favorite cleaning tips and hacks. I’ll be add more as I come across awesome tips. First off my favorite cleaning tip of all time: Microfiber. Yup, this cleaning cloth picks up lots of gunk from any surface and leaves hard surfaces shining and streak free. I love them, therefore you should try them out. I dare you. Use extra virgin olive oil to buff away surface scratches on your leather furniture. Take that tangy zip of miracle whip and use it to get rid of water rings on wood furniture. Use newspapers to clean windows for a streak free shine. Use a door mat to stop dirt tracking into your house and enforce a no shoes rule. Use a pillowcase to remove dust from ceiling fans. Open the pillow case over the blade and slide off. Use a lint roller to remove dust from lamp shades. Remove carpet stains with cool soapy water. Keep high traffic carpet paths at bay, vacuum these areas at least twice a week. Get tree sap out of your carpet by blotting with rubbing alcohol, or freeze with an ice cube to harden and scrap off. Sprinkle baking soda over your carpet; let it sit for 20 minutes then vacuum to get rid of funky smells. Place ice over gum on carpet to harden it then it will be easier to scrape up. Vacuum Oriental rugs with the beater bar on the highest setting or turned off as the beater bar can damage the rug. Clean leather with coconut oil. Easily remove nail polish or paint from your hardwood floors using rubbing alcohol. Test in an inconspicuous spot then apply and gently rub. Out of laundry sheets? Use a ball of tin foil to prevent static and soften clothes. Use vinegar in place of fabric softener as a cheaper solution and truly cleaner clothes. I solemnly swear I am up to good and it does not make your clothes smell like pickles. Get blood stains out of clothes with cold water and a little bit of hand soap. Use rubbing alcohol to get ink stains out of clothing. Use a q-tip and rub from the middle to the edges so the ink doesn’t spread. Add a couple tennis balls to the dryer when drying pillows or other fluffy items to keep the filling from clumping. Use two parts hydrogen peroxide one part blue Dawn/Castile soap as a grease stain fighter. Wool balls in place of dryer sheets and to make your clothes dry faster. Borax, Washing Soda and Fels Naphtha makes a great DIY laundry detergent. Use cooking oil to make your stainless steel shine. Sanitize kitchen sponges in the microwave. Wet then pop it in for 2 minutes. You can also leave it soaking in vinegar overnight. Equal parts olive oil and vinegar make a great wood cutting board polish. Sprinkle a little baking soda in the kitchen trash bag to keep odors at bay. Use aluminum foil as a scrubby for your glass dishes. Freshen up a garbage disposal by putting a few citrus peels down the drain and turning it on. Occasionally put ice cubes in you garbage disposal and turn it on. This helps keeps the blades sharp. Clean the refrigerator coils every few months. Clean the wheel of your can opener using vinegar and a tooth brush. Ketchup works well to shine up your copper cookware. Clean your coffee maker by running a cycle of vinegar through to descale everything followed by a few cycles of water. Mix baking soda and dish soap for an awesome soft scrub. Remove tarnish from silver with a paste of baking soda and water. Grind up some rice in your coffee grinder to clean it out. Dryer sheets will help melt stubborn grease off of oven racks. Make Goo Gone with oil and baking soda in about a 2-1 ratio. Place rugs in the kitchen to pick up oils off your feet and stop them from transferring to carpet. 1/2 Lemon and salt easily removes hard water stains. Equal parts Blue Dawn and Vinegar make a powerful tub cleaner. Have tarter build up on your retainers? Soak them in vinegar for an hour then brush with toothpaste. Soak shower heads in vinegar to remove build up. Put a small piece of a Magic Eraser in the toilet overnight to get rid of stubborn rings. Fake clean a bathroom by simply wiping down the counter, sink, toilet, mirror and closing the shower curtain. Place the toilet scrubber between the bowl and seat to dry out. Mix a few tablespoons of borax in a bucket hot water and mop those floors to easily remove hair spray residue. Remove hair dye from counter tops & floors. Remove black scuff marks on baseboards from the vacuum. Get rid of coffee stains in your favorite mug. Remove ink from almost any surface. Clean and shine hub caps. Remove dirt easily from textured surfaces and tiny crevices. Banish grease from pots and pans. Remove rust stains from the tub. Erase fingerprints from white appliance handles. Get rid of hazy headlights with baking soda or white toothpaste. Simply buff with a cloth and rise with water. Add a little baking soda for extra oomph. Get rid of paper clutter and sign up for electronic statements for banking and bills. Use rubbing alcohol to remove permanent marker from white boards. Use nail polish remover to clean a burnt iron. Tape a paper tub to the end of your vacuum hose attachment for a flexible nozzle. Rub a bounce dryer sheet on baseboards every month or so to help deflect dirt, dust, and hair. Secure a cleaning cloth on the end of your broom with a rubber band to dust in high places. Use a microfiber cloth to clean glasses lenses. Remove white build from wire retainers by soaking them in vinegar for 30 minutes. Heat up stuck on stickers with a hair dryer for easy removal. Use fuzzy socks for reusable Swiffer Sweeper refills. Thanks for all of these great ideas in this post and here on your site. any suggestions? I have tried everything,I think!!!!! My thoughts are to try vinegar. Vinegar works wonders with a lot of water stains, however, there’s a possibility of the vinegar removing some sealant from the stone. Another solution to try is a thick paste of flour and hydrogen peroxide. Put the paste on 1/4 inch thick and cover with plastic wrap sealed with tape. Leave for 24 hours covered then remove plastic and let the paste completely dry. With a plastic scraper, scrape dried paste off and buff clean. I hope this helps! I found a good article on granite stains here. What great ideas!! I am excited to try a bunch of these ideas out! LOVE IT! thank you for posting this! Thanks so much! I love coming over to your blog every week. Great ideas! I’m pinning this so I can come back to it. Thanks for linking up to Frugal Crafty Home Blog Hop! LOVE these tips! Thanks so much for sharing them! I’m especially in love with the laundry tips! Awesome tips, especially since I can’t find my floors, right now…. Love the cleaning ideas and tips! Great article. Haha I do the bathroom “fake clean” way too often! Great list of tips! Found you from Ladybird Ln. This is just what I need. I’m prepping my house to sell and you gave me some awesome tips that I didn’t think about! You’re welcome. Thanks for checking my blog out. i love all of your ideas! they are fantastic! i have a question though. Do you know how to get candle wax out of carpet?? Hi Paige! Scrap up as much of it as you can with the dull side of a butter knife. Then place a paper towel of the spot and iron it on warm. Here’s a video showing how. I have never heard about the egg whites before, I’ll have to give that one a try. Thanks for your tips! how do I get the funky smell out of my laundry after it sits for about 2 weeks? And before you answer, I use All Free&Clear, Downy (blue w/pink lid) I put about 1/2 C baking soda with vinegar in the wash and a dryer sheet. This is the only kind of detergent and fabric softener I can use. I have tried extra rinses, drum cleaning on washers. we bought a new washer and dryer thinking that was it. We have a HE washer. this has been an on going problem for several years. I have tried it all, believe me. What it sounds like to me is that there might be soap residue left on your clothes causing them to stink. What I would do is make sure there is no soap residue build up in your washer (if you have a front loader use this tutorial), then run your laundry through a few cycles of very hot water with no soap or softener to strip out any residue in the fibers. I would also consider switching your fabric softener from Downy to vinegar, I promise it won’t make your clothes smell like pickles. I have had the same issue with certain clothes. Such as my daughters soccer clothes. Sometimes the fibers of the clothes just absorb body odor and it is super hard to get the smell out. I have soaked those clothes in a mix of vinegar and baking soda. Then washed them. If it doesn’t come out I just replace those clothes. It’s frustrating but the new types of fibers of clothes meant to wick away sweat from the body really hold onto the smell. It is not the washer or the soap it’s the clothes!! BTW, you can also use aerosol hairspray to remove ink from clothing. Works great! And thank you for all the great tips! I didn’t know you could use MiracleWhip to remove water marks on furniture. I thought it had to be Mayonnaise. Have you tried both to see if one did a better job than the other? I have use hairspray in a pinch to get ink out. 🙂 As for the Miracle Whip vs Mayo, I have not tried both but have seen tips using either one. Thanks for the great tips! I will put these to good use when cleaning. Something I have found in bathrooms, if there is a standalone sink, the bottom of the bowl/rim sometimes can collect water and dust/muck (sometimes brown or yellow) in droplets…These little drops can hold a great amount of bacteria and also can hold smells that aren’t too pleasant. Thanks again for some great tips for me to use! I love all you tips, I just wandered if the hairspray removal of Borax and H2O would be safe to use on Pergo floors?? You share great tips on what to use for cleaning that I would like to use, but you don’t tell how much of each to use. For example the soft scrub, do you put the dryer sheets right on the oven racks, is so @ what temp & how long, also I’d like to know how to make the too gone. I guess I could mess around & try to get it right, but it would be great to know how from the start. Thanks so much, I hope I’m not being a pain. Nice tips! Found some good new recipes to try. As a professional cleaner I’m trying to give quality recipes and advises to my clients and your suggestions seem to be very helpful. Glad I found your post and thanks for sharing! How do I get smoke stains off my enameled pizza oven . Have tried any things but it is not moving. Hi, just wondering how much vinegar do you recommend using in place of fabric softener – do you use white vinegar or apple cider vinegar? I have a front load washing machine and I usually use dryer sheets that are basically free and clear. Thanks so much – just came across your site today!! The best and easiest way to clean up blood stains is hydrogen peroxide! Learned it as an OR nurse! You have some amazing tips, this so useful for DIY cleaning, without a doubt. The article you refer to the beginning of this article, about removing the stain from carpets; is an easy and simple way of effective cleaning. Worm water with light dabbing works and even vinegar is useful. Thanks for sharing Angela! This is very nice cleaner. very nice post, i certainly love this website, keep on it. how do you clean the stains off baking pans/cookie sheets? ?